4th of July is fast approaching! 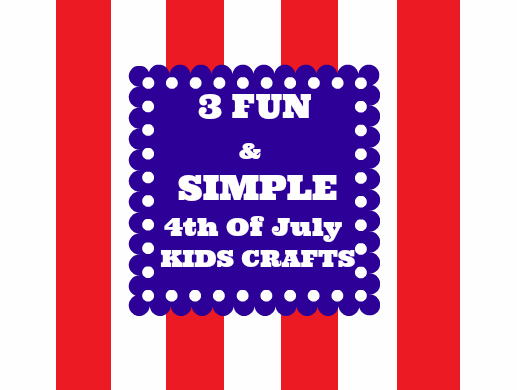 As your family prepares for all of the festivities that come along with celebrating America's Birthday, how about crafting up some fun 4th of July decorations with the kids this weekend? We made 3 up-cycled crafts this past week. 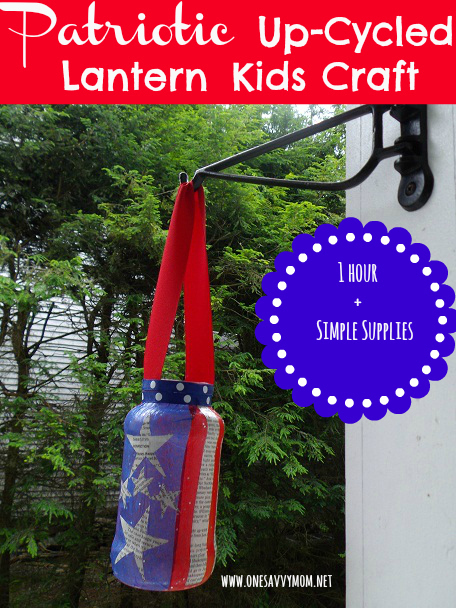 All 3 crafts are very easy to assemble and require only simple supplies - most of which you most likely already have around the house and in the recycling bin. My daughter LOVES paint/color by number projects. So I made her this very simple "paint by color" Flag with an up-cycled egg carton. Just use a crayon or marker to mark out which colors your child should paint on each egg container - and let them get creative! After the paint has dried add a ribbon to hang their masterpiece [affix ribbon with 2 small pieces of tape on either side]. Ribbon [8" piece] for creating a hanger. We have hangers on our porch, so we decided to make some DIY Patriotic lanterns [to house battery operated tea lights] for the 4th of July. These are very easy to make! Simply cut out strips of up-cycled newspaper, strips of red tissue paper [we made ours about 1"W x 7"H - measurements will vary depending on the container you use] and a large [about 5"W] strip of blue tissue paper. You will also want to cut a few stars out of your up-cycled newspaper. After everything is cut out, simply paint a thin layer of Modge Podge all over your up-cycled jar and arrange your strips as pictured. Next, paint a thin layer of Modge Podge on top of the area with the blue tissue paper and affix your stars.When your stars and stripes are in place, paint a thin layer of Modge Podge over top of the tissue paper and newspaper. Allow adequate time for drying and repeat with a second thin layer of Modge Podge. Allow adequate time for drying. Place a battery operated tea light in your finished lantern and place it in the center of your table or tie a ribbon around your jar to create a hanging lantern[as pictured]. 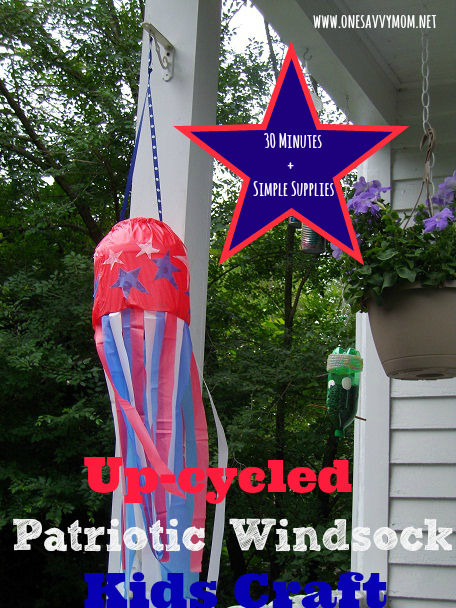 This up-cycled patriotic windsock is incredibly easy to make and requires an old container [we used an old plastic 2LB pretzel container -- you could also use an old coffee container or any 1-2 gallon plastic container] 3 vinyl table clothes [we found them at target for $1 each] and a few other simple supplies. Simply take the top off of the container that you choose and cut the bottom off [this step should be done by an adult]. cut a piece of red vinyl table cloth large enough to cover the container. Use scotch tape to secure it to the container [we wrapped ours around and taped in on the inside of the top / bottom on the container]. Next, cut strips of red white and blue out of your vinyl table cloth [about 10 2" W x 8" H strips in each color]. Use clear tape to secure them to the bottom of your container [from the inside]. Finish off your container by cutting out red, white and blue stars [8-10 in varying sizes] from the remaining vinyl tablecloths [use craft glue to affix] or use permanent markers to decorate. Use 2 small pieces of tape to affix a ribbon for hanging to the either side of the top [inside] of the container. Happy Crafting! I hope everyone has a fabulous 4th of July holiday!